The Shell Eco-Marathon challenges students to design, build and drive ultra-energy-efficient vehicles. The Motor City was the backdrop to this competition that featured universities and high schools throughout the world. 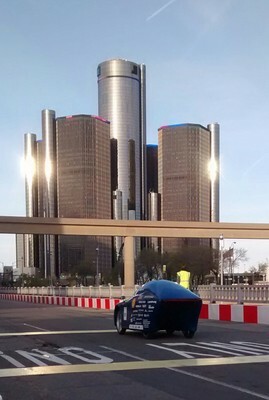 By the time the competition concluded, Cedarville University’s super-mileage car team continued its demonstration of excellence in developing fuel-efficient vehicles at the 2016 Shell Eco-Marathon Americas with a second place finish in the Urban Concept division and sixth place in the Prototype Gasoline category. The event was held April 23-24 event in downtown Detroit. Weinstein, Mark D., "Super-Mileage Team Shines at Eco-Marathon" (2016). News Releases. 285.